Welcome to our ultimate guide for collecting every Power Moon from the Mushroom Kingdom in Super Mario Odyssey! Below, you'll find maps detailing the exact location for all 104 of the Power Moons located in this Kingdom, as well as descriptions on how to get each and every one of them. 1. Perched on the Castle Roof: Just to the west of the castle you'll find a scarecrow - throw Cappy at this scarecrow to reveal a staircase to the castle's roof. When you're on the roof, head over to the northeast corner of it to find a Power Moon hovering over a spire. 2. Pops out of the Tail: At location 2 on our map, just west of the fountain near the stream, you'll find a tree that has a branch that looks like a tail. Throw Cappy at the tip of the tail by holding down the 'Y' button for a couple of seconds to reveal a Power Moon. 3. Caught Hopping at Peach’s Castle! : In the east of the Kingdom you'll find a hedge garden ran by a Toad. Within the maze-like hedges you'll spot a rabbit and, if you catch it (using Cappy to stun it if necessary), you'll receive a Power Moon. 4. Gardening for Toad: Garden Seed: Just to the west of the Toad's garden in the east of the Kingdom, you'll find a seed. Take this seed to Toad's garden and throw it into one of the plant pots there - if you wait a while, it will sprout into a fully grown plant containing a Power Moon. 5. Gardening for Toad: Field Seed: There is a seed at location 5 on our map, sitting on the floor in between two trees near the Crazy Cap store. Take this seed to Toad's garden in the east and throw it into one of the plant pots there - if you wait a while, it will sprout into a fully grown plant containing a Power Moon. 6. Gardening for Toad: Pasture Seed: Just south of the sheep pen in the west of the Kingdom, you'll find a seed sitting underneath a tree (location 6 on our map). Take this seed to Toad's garden in the east and throw it into one of the plant pots there - if you wait a while, it will sprout into a fully grown plant containing a Power Moon. 7. Gardening for Toad: Lake Seed: You'll find a seed sitting at the bottom of the lake (location 7 on our map). Take this seed to Toad's garden in the east and throw it into one of the plant pots there - if you wait a while, it will sprout into a fully grown plant containing a Power Moon. 8. Grow a Flower Garden: Just north of Toad's garden, you should be able to spot a circle of flower buds, with another smaller circle inside it. Stand in the centre of the smaller circle and perform a spin throw so that Cappy touches all of the buds in quick succession. You'll receive a Power Moon for your troubles. 9. Mushroom Kingdom Timer Challenge: Just north of Toad's garden, you should be able to spot another Toad standing next to a scooter. Hop onto the scooter and drive it to the nearby scarecrow. Now jump off the scooter, throw Cappy at the scarecrow, and jump straight back onto the scooter to reach the Power Moon that appears in time. You can't make it there quickly enough on foot. 10. Found at Peach’s Castle! Good Dog! : Locate the dog wandering around near the Crazy Cap store and befriend it by playing with it for a moment. Take the dog over to the top of a small hill at location 10 of our map (in the southeast of the Kingdom) - if you have the correct hill, the dog will dig up a Power Moon for you. 11. Taking Notes: Around the Well: In the west of the Kingdom, at location 11 on our map, you'll find a pipe that takes you into a 2D section running around the outer wall of a well. Head inside the pipe and run all the way around the well, touching the glowing treble clef at the end. Now sprint back all the way around, collecting all of the music notes that appear in the wall and out, to get the Power Moon. 12. Herding Sheep at Peach’s Castle: If you talk to the Toad in the sheep pen (location 12 on our map - in the west), you'll find out that he has lost six sheep. If you round up all of these sheep into the pen, either using Cappy to send them flying forwards or just by running behind them, the Toad will give you a Power Moon. The first one is sitting just east of the sheep pen. Another one is directly north of the pen, standing near the well. There’s one quite close to the Odyssey, walking around near the warp painting on the floor. At the northern most point of the map you'll find Goomba Woods - a sheep is standing on the western side of these woods. There is another sheep at the eastern side of the Goomba Woods, close to a nearby rocket. Head northeast from the Crazy Cap store to find the final one in the east. 13. Gobbling Fruit with Yoshi: Just to the west of the castle you'll find a scarecrow - throw Cappy at this scarecrow to reveal a staircase to the castle's roof. Now make your way over to the opposite side of the roof to find a Yoshi egg - break it open, and capture Yoshi. As Yoshi, you'll need to eat ten of the thirty pieces of fruit dotted around the Kingdom. 14. Yoshi’s Second Helping! (see location 13): Follow the steps for Power Moon 13. You'll get this Power Moon by eating another ten pieces of fruit, totalling twenty. 15. Yoshi’s All Filled Up! (see location 13): Follow the steps for Power Moons 13 and 14. You'll get this Power Moon be eating another ten pieces of fruit, and therefore every piece in the entire Kingdom, totalling thirty. 16. Love at Peach’s Castle: To get this Power Moon, you'll first need to drain all of the water from the moat surrounding the castle. Jump into the water there and unplug all of the pegs in the circle of water around the castle. With the water drained, head up to Goomba Woods and make a tower with every Goomba that you can see there. 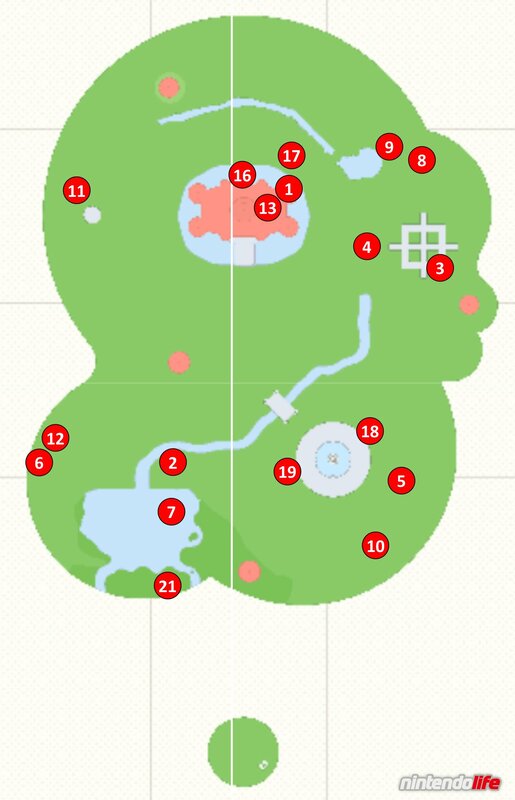 You should now be able to walk over to location 16 on our map (on the north wall of the castle) and take the Goombas to a Goombette standing on a high platform. She'll reward you with a Power Moon for getting there. 17. Toad Defender: Just above the Goomba Woods there is a Toad guarding a tunnel to a Power Moon on a small ledge. If you capture one of the Goombas and walk over to him, though, he'll run away out of fear, leaving the tunnel free for you to collect the Power Moon. 18. 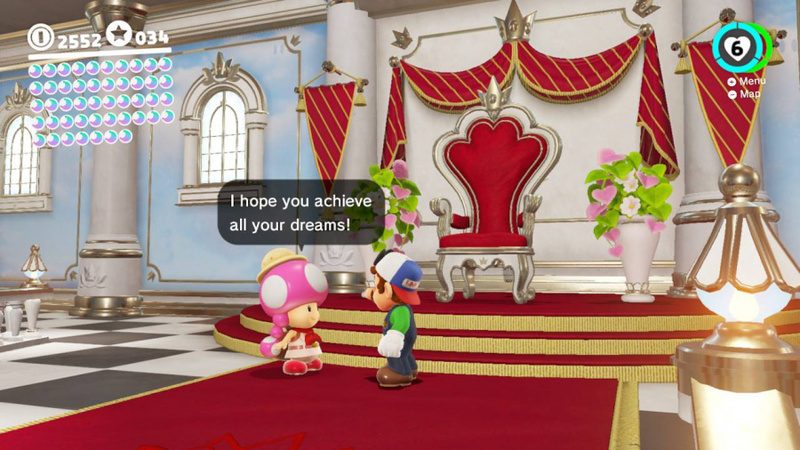 Forever Onward, Captain Toad! : Captain Toad is sitting on top of the Crazy Cap store. Simply perform a backflip, and then a dive, from the crates nearby to reach him. He'll give you a Power Moon if you talk to him. 19. Jammin’ in the Mushroom Kingdom: Talk to the headphone-wearing Toad standing just to the west of the fountain. If you play him any of the 8-bit songs from your collection, he'll reward you with a Power Moon. 20. Shopping Near Peach’s Castle (see location 18): You can purchase this Power Moon from this Kingdom's Crazy Cap store for 100 gold coins. 21. Mushroom Kingdom Regular Cup: Head to location 21 on our map (beside the lake in the south) to find a Koopa who will challenge you to a race for a Power Moon. This is actually a surprisingly simple race to win. Head straightforwards from your starting point, and then up and around until you can head towards the goal in a straight line. The only trick you'll need is to make sure to capture the Rocket Flowers along the way - as long as you run all the way with these flowers, you'll win with plenty of time to spare. 22. Mushroom Kingdom Master Cup (see location 21): In the same location as Power Moon 21, talk to the Koopa for a second time to start a second race for a second Power Moon (ahem). This is still surprisingly easy to win. As before, head straightforwards from your starting point, and then up and around until you can head towards the goal in a straight line. The only trick you'll need is to make sure to capture the Rocket Flowers along the way - as long as you run all the way with these flowers, you'll win with plenty of time to spare. 23. Picture Match: Basically Mario: In the northeast corner of the Kingdom you'll find a rocket that can be captured. Take this rocket to arrive at a Picture Match challenge. You'll need to re-create Mario's face from the picture pieces, with a score of 60 points needed for the Power Moon. Take a good look at the image before his features disappear, taking into account where the disappearing pieces line up with those that remain. 24. Picture Match: A Stellar Mario! 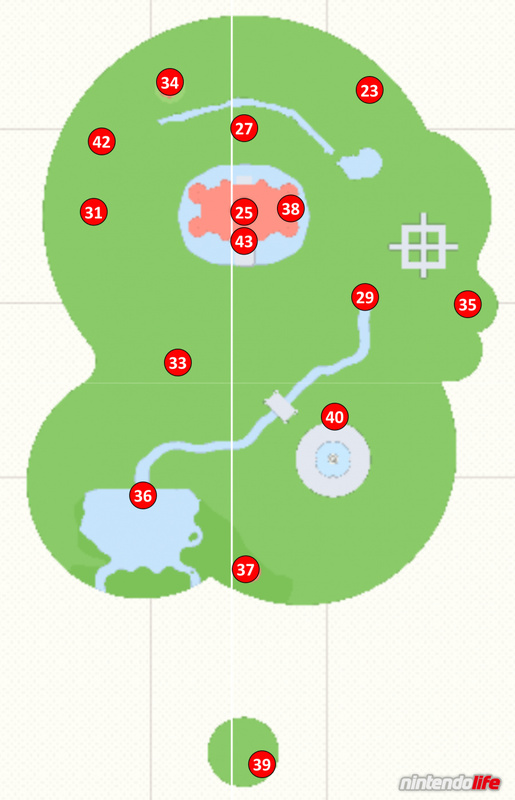 (see location 23): In the same area as Power Moon 23, talk to the Toad once more to start a second challenge. This one is much harder - you'll have to re-organise Mario's facial features with only a black and white outline to help. We'd advise making use of the Switch's capture button if you want to be cheeky but even that won't necessarily be enough to help unless you really pay attention to the features. The one main thing to point out here is that it makes a big difference if you manage to get the correct eyes on either side. His iris is slightly off centre - meaning that the white of his eyes have one thin, and one thick side. The thick side needs to be at the top (nearest his hat). 25. Light from the Ceiling: Enter Princess Peach's castle and stand on the rug in the middle of the floor (it looks like the Sun). Enter 1st-person view (by pressing down the right control stick) and look directly up to the ceiling. If you get it in just the right spot, with the light in the centre of the screen, a Power Moon will pop out. 26. Loose-Tile Trackdown (see location 25): Inside Princess Peach's castle, head to the far-left corner of the ground floor to find a tile that is slightly raised from the ground. If you ground pound this tile, another raised tile will appear somewhere else in the room. You'll need to ground pound a total of eight tiles to receive this Power Moon - make sure to note that they always alternate from white to black, and that they can be on either floor of the building. 27. Totally Classic! : For this Power Moon you'll need to be wearing the Mario 64 Cap and Mario 64 suit, available from this Kingdom's Crazy Cap store. When you are wearing these items, head to location 27 on our map (you should find some small ledges overlooking the Goomba Woods) to find a Toad guarding a locked door - he'll let you in thanks to your outfit choice. Inside, throw Cappy at the top of the star in the fountain by holding down the 'Y' button for a couple of seconds to receive a Power Moon. 28. Courtyard Chest Trap (see location 27): In the same area as Power Moon 27, you'll need to hit the eight treasure chests in a specific order to receive a second Power Moon. If you're struggling, the order (from your initial entrance point) is: middle-right, top-left, top-right, bottom-left, bottom-right, middle-left, grass on the right, grass on the left. 29. Yoshi’s Feast in the Sea of Clouds: You'll need to capture Yoshi for this Power Moon - just to the west of the castle you'll find a scarecrow and, if you throw Cappy at this scarecrow, you'll reveal a staircase to the castle's roof where you'll spot Yoshi waiting for you in an egg. As Yoshi, head to the end of the stream at location 29 on our map and eat the piece of fruit blocking the pipe there. Inside, you'll need to eat every piece of fruit in the room to get this Power Moon - don't miss the two at the top of the two tall columns at the far end of the area (you can use Yoshi's tongue to 'tongue-jump'(?) to the top. 30. Sunken Star in the Sea of Clouds (see location 29): In the same area as Power Moon 29, head left from the very first platform to find a slightly lower platform hidden underneath the clouds. Use Yoshi's tongue to help you see and keep walking forwards to find a Power Moon waiting for you. 31. Secret 2D Treasure: This Power Moon is in the same area as Power Moon 32 below and, strangely, you'll actually find number 32 first. Follow the instructions for that Moon below, and then continue making your way through the 2D area. Eventually, after jumping through some rotating structures, you'll find a green pipe. Enter this pipe to be taken to an area underneath the starting position where you'll find a second Power Moon. 32. 2D Boost from Bullet Bill (see location 31): Head to location 31 on our map in the west to find a well. Jump down into this well to stumble across a new area with a 2D section. You'll need to make your way through this area, making sure to always have the moving backgrounds behind you as you move along. As you're travelling through the part with Bullet Bills, you'll see this Power Moon high up in the air - you'll need to jump from one of the Bullet Bills to boost yourself up to it. 33. Tussle in Tostarena: Rematch: Enter the tower at location 33 on our map, and then the painting inside, to start a rematch with a boss from the Sand Kingdom. The fight is the same as before, just harder; you'll need to avoid Chinchos and icicles as you attempt to capture the boss' fists, sending them flying into its face. If you win, you'll receive a Power Moon. 34. Struggle in Steam Gardens: Rematch: Head to the Goomba Woods in the north and search for a large seed on the ground just to the west of the checkpoint flag there. Take this seed to the large plant pot further west in the woods and climb the beanstalk that appears - you'll arrive at a tower with a painting inside, taking you to a rematch against a boss from the Wooded Kingdom. The fight is similar to before, just a little harder; make sure to avoid as many of the pulse waves as possible by preparing your jumps in plenty of time. Sticking to the middle is a good tactic - jumping directly towards one of the pulse wave machines when needed. 35. Dust-Up in New Donk City: Rematch: Enter the tower at location 35 on our map, and then the painting inside, to start a rematch with a boss from New Donk City. The fight is similar to the first time, except for the fact that you'll have to make a much higher number of successful shots. Focus on dodging the fireballs coming your way as a priority, landing shots on the boss as and when you can - you'll get the Power Moon when you win. 36. Battle in Bubblaine: Rematch: Head to the bottom of the lake in the south of the Kingdom and search for a green pipe at location 36 on our map above - you'll enter a rematch against a boss from the Seaside Kingdom. Strangely, unlike the other rematches, this fight is much easier this time around. Simply boost up and over the enemy's head (you have an unlimited water supply this time) and keep soaking him with your downwards water burst until you defeat him for the Power Moon. 37. Blowup at Mount Volbono: Rematch: Enter the tower at location 37 on our map, and then the painting inside, to start a rematch with a boss from the Luncheon Kingdom. This rematch is very similar to the original, with just a couple of Moonsnakes making things trickier. Defeat the boss for the Power Moon. 38. Rumble in Crumbleden: Rematch: Enter the green pipe at the bottom of the eastern wall of the castle (follow the steps from Power Moon 16 if you haven't drained the moat yet, and use Yoshi to remove the fruit there) to find another boss rematch painting. This time you'll be up against the boss from the Ruined Kingdom and, once again, this time around it is slightly harder. If you get hit by the electricity (which is a very likely occurrence) make sure to ground pound the glowing spots in the ground to regain health. 39. Secret Path to Peach’s Castle! : For this Power Moon you'll need to enter the Mushroom Kingdom from a warp painting located in the Luncheon Kingdom. Head there, and make your way to the Remote Island in the Lava in the northeast. On this small island, walk down the steps on the right-hand side of the island and jump into the painting - you'll find yourself at Yoshi's house. Use Cappy to put out the fire and wall-jump to the top of the chimney to find this Power Moon. 40. A Tourist in the Mushroom Kingdom! : For this Power Moon, you will first need to have spoken to the Tostarenan in the Sand Kingdom who was hoping for a taxi. If you have done this, you may have noticed him (and his taxi) sitting in obvious spots in various Kingdoms. Each time you talk to him, he'll move to a different Kingdom (giving you a hint as to which one each time) and eventually, he'll wind up here. If you've found him enough times, he'll be waiting for you at location 40 on our map, just north of the fountain. 41. Found with Mushroom Kingdom Art (see location 25): Inside Peach's castle, look at the wall in the top-right of the ground floor to find some hint art. It shows the Cap Kingdom - so fly there, and walk from the Odyssey to the first bridge in front of you. You'll need to line up the large, hat-looking tower with the moon behind it, so that it perfectly re-creates the picture (take note of how much of the moon is visible in the picture). When you're in the right spot, perform a ground pound to discover a Power Moon. 42. Hat-and-Seek: Mushroom Kingdom: You'll find a Bonneter just to the left of the entrance to Peach's castle -it'll tell you that someone it knows is missing. Head to the northwest, specifically aiming for location 42 on our map, to find a Toad wearing a hat with eyes - speak to this hat to receive a Power Moon. 43. Princess Peach, Home Again! : Just to the west of the castle you'll find a scarecrow - throw Cappy at this scarecrow to reveal a staircase to the castle's roof. Climb up, and walk over to the front of the castle so that you can fall down to the balcony below. There, you'll find Princess Peach and, if you talk to her, she'll give you a Power Moon. Note that for Peach to appear in this spot, you will need to have found her in every other Kingdom first. If you need to find her elsewhere, check out our other Power Moon guides below to find her in every one. The following Power Moons are acquired by talking to Toadette who is waiting for you upstairs in Princess Peach's castle. The list below contains all of the Power Moons that are available through Toadette - the numbers in brackets indicate the amount of times you'll need to complete the relevant action to unlock that Moon. 44. Rescue Princess Peach: Rescue Princess Peach from Bowser. 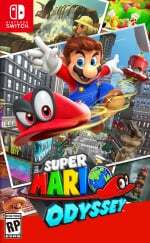 We hope that you have found this guide on collecting all Power Moons in Super Mario Odyssey's Mushroom Kingdom useful. Let us know if you've managed to grab them all with a comment below. Isn't it kind of a spoiler that the Mushroom Kingdom is in the game? Finding the picture that took me to yoshi’s house with peach’s castle in the distance was such a nostalgia high I almost shed a tear. And then getting the star with the 64 music sealed the deal. Same here..... From a nostalgic point of view I absolutely loved this kingdom and it was a fantastic surprise to discover it. @countzero The game has been out for AGES. I hope those who aren’t getting this until Christmas weren’t spoiled by this. Hard to not know already I guess with how the internet is though. @Damo A month and a half isn't that long, especially when many people like me aren't getting the game until Christmas, not that I personally care about seeing the Kingdom names but I can understand why it bothers some people. Especially when you could just say "We've added a new kingdom to our Odyssey guide, click for details"
To be fair, Nintendolife is good for not posting pictures of newly revealed Pokemon on the front page before new games come out, which is something I care far more about. Game Freak really don't like their fans to be surprised or make new discoveries in-game. To finally go on-topic, I can't wait to see this Kingdom, sounds fun! So it's a spoiler, right?? I hope this is not the "surprise" for when you finish the game... Really. @countzero yup and also the king's outfit. i was really surprised by both in game. especially because we can enter Mushroom Kingdom through Yoshi's island the first time but can't get to it until later. wth nlife? I mean I beat the game so I know all this but it’s a bit much, even the Moon Kingdom was just... well, I don’t know, I guess the website isn’t set up in a way to post these guides outside of the front page but yeah, I agree with @Waluigi_fan on how it could’ve been handled, no one has to know what kingdoms these are, let them have some surprises, this was one of the best surprises in the game. Nintendo Life should stick to news, reviews and opinion pieces - which are all fantastically done! Leave FAQs and guides to specialized websites so only people looking for them will find them. @FernandoMachado Actually, this is my favorite moon guide so far. And telling NintendoLife what not to do is pretty lame and honestly I doubt they'll care since this was obviously not written for you.